India will allow locally registered foreign firms to mine and sell coal when commercial mining is permitted as part of the opening up of the nationalised industry after four decades, Coal Secretary Anil Swarup told Reuters. To end a chronic coal shortage that cripples power plants and curb the country's imports of the fuel, the Narendra Modi government will also spend about $1 billion by 2019 to buy railway wagons and transport coal from remote mines, Swarup said in an interview on Thursday. The decision will open the door to global giants like Rio Tinto and BHP Billiton and help ramp up output from India's huge reserves - the world's fifth biggest. 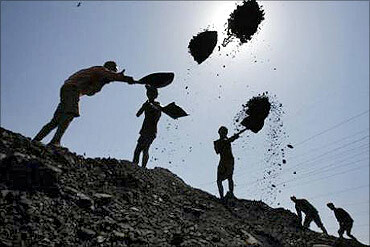 "Any company registered in India can bid (when a commercial coalfield auction takes place)," Swarup said. "So a foreign company registered in India can also bid, provided they fulfil other conditions." As of now, only power, steel and cement companies can mine coal for their own consumption. Commercial mining in India is dominated by state-owned Coal India Ltd.
Coal India is the world's largest miner of the fuel but its unionised workforce resists mechanisation fearing job losses. The resulting inefficiencies are partly responsible for years of missed output targets and India's coal imports. "Our attempt is to convey our feelings to them that under no circumstances will the interest of Coal India be adversely affected by the decisions of the government," Swarup said. He was also enthused by the likely selection of Sutirtha Bhattacharya, chairman of India's No.2 coal producer, as the next head of Coal India. Though much smaller, Bhattacharya's Singareni Collieries has been able to surpass its output target every year. Swarup said the government will finalise a roadmap by Dec. 15 to more than double Coal India's output to 1 billion tonnes by 2019. The company will buy 260 more trains on top of the 200 under operation to move coal from new mines.